Being respectful should not require silence! 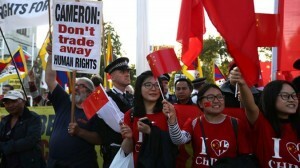 Protesters against and supporters of President Xi stand shoulder to shoulder in London. 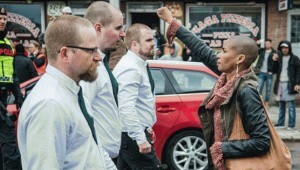 Could this scene be replicated in Beijing? For many years now I have had the privilege of travelling to work with teachers and researchers in many parts of the world. Sharing ideas with colleagues and sometimes wrestling to interpret these in different cultural contexts has been a great privilege, and has afforded me opportunities to see how other people live, work and try to make sense of the world. Amidst all this, I hope that the experience has taught me to be respectful of other societies and to be prepared to engage in critical discussions whilst making an effort to understand a broad range of motivations and contexts. The British media today is dominated by reports of the visit to the country by China’s President Xi Jinping. Yesterday he was afforded all the pomp and ceremony in which this country excels. State banquets, an audience with the Queen, an opportunity to address the UK Parliament and a ride along the mall in a carriage more suited to a performance of Cinderella than to the streets of twenty first century London. Unsurprisingly the President’s visit has divided the nation, with those who are in favour of accepting potentially high levels of investment from China into the development of UK infrastructure, juxtaposed with others who believe that we should not be welcoming a dictatorial leader who has overseen increased human rights atrocities in his country. I have visited several parts of China on a number of occasions and over the past fifteen years have made a number of good friends and colleagues in the country. I have also worked with some outstanding Chinese students who are now making a significant contribution to education back in their homeland. These valued contacts have often afforded me kind hospitality in their country and sometimes in their homes. As with others from around the world, they are proud of their country with its rich history and traditions, though in private many are also critical of the many injustices that they see as characterising modern day China. 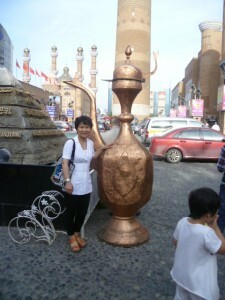 China is a vast country and I cannot claim to have seen much of its broad spread. However, I have seen enough to form some idea of the rich diversity within its peoples and culture. As well as Han Chinese colleagues in the East of China and Beijing, I have enjoyed time with friends in the Muslim Uygher communities in Xinjiang Province, and recognise that not all citizens of this vast country have the same interpretation of what it means to be Chinese. I am quite sure that my brief visits to China have shaped much of my thinking about the kind of society that has been created in this diverse part of the world. These thoughts have been very much to the forefront of my mind as I have watched the red carpet treatment given to President Xi Jinping following his arrival in London. It seems to me that when visitors come to the UK, whoever they are, we should ensure that they receive a warm welcome and that they are made comfortable. Inevitably if they are a Head of State we would expect that they should be granted access to those in positions of responsibility and leadership in the country. However, if we are welcoming visitors as friends, as was implied by both the Prime Minister Mr Cameron, and by President Xi Jinping in speeches yesterday, we should expect that a frank exchange of views, as is common between friends might ensue. Freedom of speech is something which was hard won and is now treasured in many of the world’s great democracies, including the UK. Ma Jian has every right to voice his opposition to Chinese Government oppression, and it is to the credit of the UK Government that he has been made welcome as a resident of this country and is provided with a platform from which to express his opinions. Sadly there are many other Chinese nationals who are in a similar position to Ma Jian and find that whilst their work and ideas are appreciated and indeed honoured outside of China, they face imprisonment and torture if they express themselves within their own country. The artist Ai Wei Wei has received many plaudits for his exhibition currently to be seen at Royal Academy in London, the Nobel Prize winning writer Liu Xiaobo is currently being held as a political prisoner in Jinzhou, Liaoning, whilst his work is honoured in most parts of the world, and the lawyer Xu Zhiyong founder of the Chinese New Citizens’ Movement which has campaigned for the rights of Chinese citizens is similarly incarcerated. These individuals and many thousands of others who, being less well known have escaped the attention of the western media, do not appear to have a voice in the current negotiations being conducted between the UK Government and the Chinese President. Unlike some who have written in the British press or appeared in interviews on the radio, I do not believe that we should have refused President Xi Jinping entry to the country. However, if as Mr Cameron suggests, there are opportunities for strengthening bonds between the governments of two countries, I would hope that he provides the kind of critical friendship that in recognition of those values of human rights and social justice that are often said to characterise the UK, enables him to express his abhorrence of the repression and ill-treatment of those who voice opinions contrary to those of the totalitarian regime that administers China. Having been lavishly entertained at Buckingham Palace and the Houses of Parliament President Xi Jinping may now be in need of a day of leisure. If so, he could do far worse than visiting the Royal Academy to see the work of his fellow countryman Ai Wei Wei. I suspect that this is an unlikely scenario as it would demand a willingness to engage in a learning experience that could be in danger of broadening his perspectives. Who decides what you should know? Caution, the content of these books could expand your mind! The well respected Pakistan newspaper Dawn reports that yesterday the blogging platform WordPress was blocked (23rd March 2015), and those who wished to either publish their own words, or to read those of others posted on blogs, were thwarted in their efforts. The same newspaper has previously commented (February 8th 2015), on the fact that the media channel YouTube remains inaccessible within the country. A spokesman for the Pakistani government has suggested that there is content on the media channel that may be seen as either blasphemous or in other ways offensive, and that the people of Pakistan need protection from such material. I am aware from friends and students that similar restrictions exist in China and in several other parts of the world, and that this is a particular source of frustration to those who have spent time in the west, and have found such media to be a useful source of debate and information. It is probably true to say that the use of media channels such as YouTube requires a certain amount of discrimination on the part of the user. There is (in my opinion) an awful lot of material available on these outlets that is insignificant, trivial and in some instances offensive, but should this necessarily be made unavailable. I suspect that my interpretation of triviality may be someone else’s notion of high culture, and why should my opinion be any more valid than theirs? By blocking WordPress and YouTube the govt. 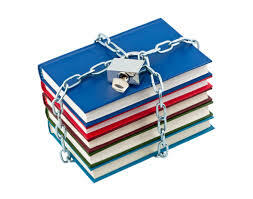 has deprived its citizens of knowledge, of education, of a basic right the constitution of Pakistan gives us. This commentator makes a valid point. When used appropriately both WordPress (which is incidentally the platform upon which this blog is based) and YouTube can act as useful educational tools. I have on several occasions used film from YouTube for teaching purposes both here in the UK, and when teaching in other parts of the world. Similarly, I have posted items on this blog with the specific intent of enabling students to continue debating issues discussed in class, and know that others have used it for the same purpose. Does this therefore mean that there should be no censorship of materials posted on the internet? This is far from a straightforward matter. Censorship when appropriately applied is designed to protect those who are potentially vulnerable or suggestible from potentially harmful influences. The British Board of Film Classification was established in 1912 as an independent body to classify films and give them a rating of suitability to a broad range of audiences. There is a general consensus that this organisation does a good job in ensuring that materials that are unsuitable for children, are classified in such a way that parents are aware, and cinemas restrict access to young viewers. Similarly, most computer systems have safety mechanisms whereby parents and schools can inhibit access to programmes and materials that may be deemed unstable for children. The notion of protecting the young and vulnerable is certainly one with which I have no problem. The blanket censoring of WordPress and YouTube is a different matter. Those who have made decisions to restrict the availability of these media outlets have not been discriminating in terms of protecting the young and vulnerable, but have rather made a decision that nobody should have access. This surely conveys a message that the censors do not feel that the general populous has either the ability or the right to make up their own minds. Adults are being treated as children, and regarded as incapable of making informed decisions. I have no difficulty with control that is designed to protect the individual. It is a good idea to enforce laws that mean for example, that in England everybody must drive on the left hand side of the road, or to ensure that alcohol is not sold to children. These are laws with good intent and a deal of common sense. However, I am unsure about who the censorship of media outlets is designed to protect. It seems to me that most adults are quite capable of policing the media for themselves. If an item comes on to the television that I dislike I can change channels or switch off the set. If I disagree with the sentiments or political association of a newspaper or magazine, I choose not to purchase them. The students with whom I work are intelligent and discriminating individuals. In my experience they make good use of media such as WordPress and YouTube as yet another source of information to be used alongside the other, more traditional sources such as books and academic journals. But maybe here is the nub of the issue. Censorship is not about the platform upon which information is conveyed, but about the power of the messages that may be contained within. After all, throughout history that wonderful, though relatively low tech product the book, has been subjected to censorship or outright banning in many countries, including my own. I do hope that my friends in Pakistan may have an opportunity to share these thoughts today. It is said that Diogenes of Sinope declared himself to be “A citizen of the World”. I was talking this morning with one of my PhD students about her research. Her work has involved observing teachers working with children in the early years of their education in schools in the UK. 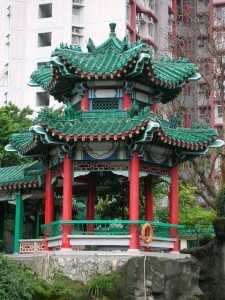 She has then taken some of the teaching approaches that she has learned and applied these in schools in her native Taiwan. Listening to her enthusiastic description of the differences of teaching approach in two countries many thousands of miles apart, and her account of what she has learned, and how she has shared this learning with teachers in both countries, reinforced my belief that there is so much to be gained from working in an international environment. Later in the day I enjoyed conversations with groups of research students from India, Pakistan, Nigeria, Vietnam, China and Colombia who occupy an office in the Centre for Education and Research at the university. Sharing a common commitment to investigating aspects of education, they bring a vast range of professional and personal experiences to the university. In addition, they have significantly different cultural backgrounds that have shaped their interpretation of the world, and are generous in exchanging these as part of their overall experience of being a student in the UK. Without exception they enjoy being part of this richly diverse community. They recognise that they have an opportunity to learn from each other, to understand the similarities and difference in the education systems of their countries, and to appreciate the varying challenges that these bring. In formal teaching sessions they exchange their views and consider how their learning may be applied to a wide range of educational situations. Informally, they share food, music, literature and ideas from their homes, and thus broaden their understanding of each other’s cultures. As tutors working with these students, we gain as much as they do from this multi-lingual and international community of learners. Opportunities to hear about their teaching experiences and the conditions in which they live and work in their home countries, and to listen to their aspirations for the future is a privilege that is to be greatly appreciated. We also benefit from a greater understanding of how educational policy and practices evolve in different circumstances, and how we may apply some of these ideas in our own situation. However, in the past year I have also detected a greater apprehension in their conversations than I recall from the past. Being an international student in the UK, and I suspect in many other countries, is much harder than in the past. The world is in turmoil and the level of trust in the unfamiliar has significantly decreased. Fear of “foreigners” appears to be on the increase and several of our students have expressed a concern that they are sometimes viewed with an element of suspicion. The burgeoning bureaucracy to which they are subjected in order to monitor their movements and the increased difficulties associated with renewing visas has become a source of frustration. Increased regulation from the UK Border Agency, understandably implemented with national security in mind and designed to discourage a small minority criminal and fundamentalist element, impacts upon all non-British nationals. My fear is that those with a legitimate desire to learn may be detered from doing so outside of their own national boundaries in the future. The students I work with are sensitive to the need for increased vigilance, but also conscious of the apparent negativity towards visitors to this country that they experience in the media, and sadly on occasions, on the streets. Much of this is founded upon ignorance, and I am sure that if some of the perpetrators of these reactions could spend time with these hard working young people, they would exhibit a different range of behaviours. Having visited several of the countries from which these students have come, I have always been received with kindness and generosity and made to feel welcome. I would like to think that this is reciprocated for colleagues who come here. I am sure that the students with whom I work as they complete their research degrees will make a major contribution to the education systems in their own countries or elsewhere in the world. I hope that as they do so they will take with them many positive memories of their time in the UK. Teachers in Hong Kong are working hard to create inclusive schools – but is Hong Kong in general ready for these? A few years ago I had an opportunity to spend time working in Hong Kong, when I was awarded the Marden Fellowship as Visiting Professor at the Institute of Education, in the New Territories District of the Special Administrative Region. During my time there, and on subsequent visits, I made many friends and good colleagues who were working at the Institute of Education and in schools. My time was spent working on research and writing projects with Professor Chris Forlin who was at that time a substantive member of the academic staff, teaching on post-graduate courses, and doing consultancy for various government agencies and schools. 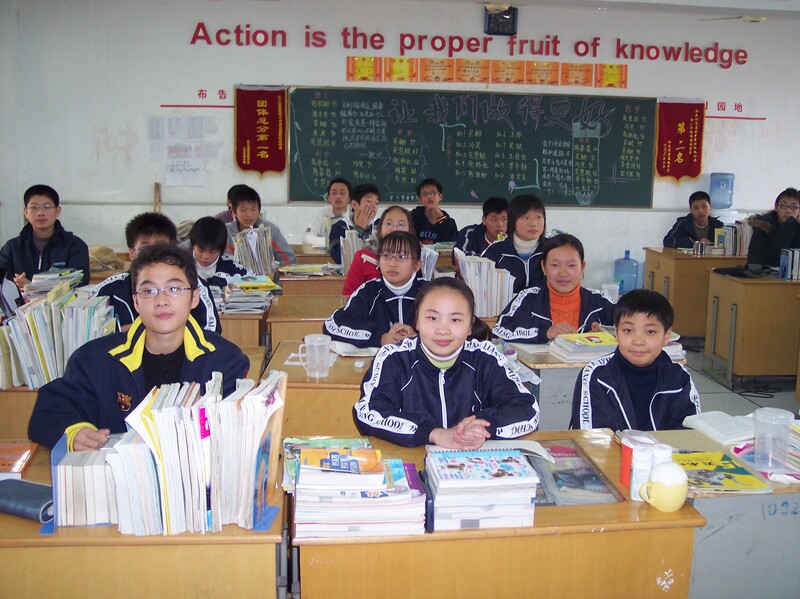 2007 – 2008 was an interesting time to be in Hong Kong as discussions about the development of more inclusive schools was high on the education agenda, and opportunities to debate the interpretation of inclusive schooling within a Chinese context were plentiful. It is seven years since I last visited Hong Kong and I have no doubt that much will have changed during that time. I must admit that as several former colleagues from the area are no longer working there, I have to a great extent failed to keep abreast of educational developments in the region. Whenever Hong Kong makes the international news, as it did most recently through the extensive pro-democracy demonstrations that brought this non-stop district to a grinding halt, I have endeavoured to play catch up with what is happening in the education field. However, the news reports around schools in Hong Kong are usually quite bland, with little focus upon the progress being made to address diversity in classrooms. Today, an article in the on-line edition of the most popular English language newspaper in the area, The South China Morning Post (23rd February, 2015), did come to my attention. Under a banner headline Special Needs Students: More Support Needed in Hong Kong Schools. Robin Cheung a retired school principal wrote about his concerns that whilst teachers in schools have shown considerable commitment towards inclusion, progress is being impeded by a lack of adequate resourcing and poor access to training for teachers. “They also resort to class streaming and put most special educational needs students together to minimise the disruptive and dragging effects on other students. It seems they are running a school within a school, but without the abundant resources enjoyed by the former special schools”. The notion of segregation within a mainstream school is certainly not new. The designation of classes for children with special educational needs, thus separating them from their peers for all academic purposes, is a model that has been seen in many countries, including my own over many years. The rationale behind this exclusive action appears to be the potential disruption attributed to children with special educational needs, an example of stereotyping if ever I saw one! This, Mr Cheung rightly observes, was never the purpose of inclusive education and is a clear indication of a failure to administer policy with the commitment needed to ensure success. The arguments rehearsed in this Hong Kong article have certainly been aired on many previous occasions, but a number of more interesting points are also made. “…rather than just keeping such students in schools and maintaining a semblance of order and learning, these students need help to develop into self-sufficient, productive citizens, but the curriculum design, pedagogical innovation, assessment and life and career planning involved are far beyond the capability of any individual schools. Their concerns just highlight the inadequacies of the present system”. A more holistic approach to developing inclusive societies that place a greater emphasis upon a broader range of skills, knowledge and understanding is seen as an important pre-requisite to enabling schools to address a broad range of learning needs. In making this assertion Mr Cheung is certainly expressing a concern that is felt by increasing numbers of teachers. If we truly believe in the development of inclusive schools, surely we must ensure that the rest of society works with us in order to understand what it is that all children can do. In this way we will be able to support them in making a valuable, and hopefully valued contribution to their communities. The news from Hong Kong may not be earth shattering, but it does serve as a reminder that schools alone do not have the answers to creatng a more equitable society. Education is as fundamental as the air we breathe. Might this picture from the past become a predictor for the school uniform of the future? I live in a cottage, one of a row of four, which stand alone, surrounded by trees and open fields, in a beautiful part of the English countryside. One of the aspects of this bucolic existence that I usually take for granted, is the clear clean air with which I am able to fill my lungs. I don’t usually give this a lot of thought, but a number of recent news items have given me good reason to be relieved that I live here, and not in other parts of the world. On a couple of occasions when working in India I have developed a somewhat irritating cough. I generally put this down to the excessive noxious fumes emanating from the congested traffic, exposure to which is often intensified by travelling the streets in the back of an open sided auto-rickshaw. Belching exhaust fumes create a murky fog that hangs above the road and often make for an unpleasant travelling experience. Several reports from scientific surveys conducted in recent months confirm that my summation of the cause of my cough is probably correct. The Supreme Court in Delhi received a report from the Indian Environment Pollution (Prevention and Control) Authority last Friday, which gave an alarming picture of the air quality in the capital city. The report confirmed the assertions made in a World Health Organization study of 1,600 cities, which indicated that Delhi’s air pollution is now officially at the highest level of any city in the world. Understandably the Indian Environment Pollution Authority have recommended urgent action to address this alarming issue, which is already having a negative impact upon the health of city dwellers. Limiting the number of motor vehicles allowed on the roads at any one time, and taking greater actions to manage exhaust emissions are proposals that one might expect. However, it was another proposal that particularly caught my attention. The authors of the report have urged the Supreme Court to order that all schools in Delhi should be closed on days when levels of air pollution are deemed to pose a threat to public health. This proposal of such drastic action must obviously be of concern to all teachers and parents in the city, yet this would certainly not be a unique situation. In Shanghai recently, as the city experienced one its worst recorded instances of air pollution, the authorities ordered that all school children should be kept indoors for the sake of their health. Elsewhere in China severe pollution recently forced school closures and the shutdown of the airport in the city of Harbin. My only visit to Shanghai was to the airport from which I departed China a few years ago. I recall from my window seat on the plane looking down and being disappointed that rather than a view of Shanghai’s famous skyline, all I could see was a murky orange cloud of smog. My memories of a visit to Delhi last year are of an excellent conference, the magnificent monument of the Qutub Minar and the moving memorial to Gandhi at Raj Ghat, but also of the slightly acrid taste of the air around the international airport. The concerns expressed for the health of children living in these cities, and the many others which have high levels of pollution and poor air quality must surely lead to drastic action. 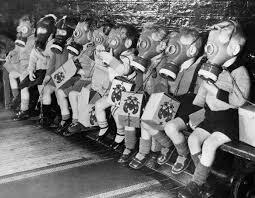 The children currently attending schools (when they are open) in these toxic environments are being left a dreadful legacy. It is probably their generation that will be required to apply even more drastic measures to undo the havoc currently being reaped across the globe. That is, of course, assuming that they are fit enough to take on this daunting task. I find myself wondering how teachers in schools in these cities address the current environmental challenges with their students? Many of today’s primary school children have never seen a pure blue sky. At night there are no stars visible, and it is no longer possible to appreciate a view across the city from a distant hill. Will history teachers be recalling the time when blue skies and stars were experienced by city dwellers? Will sweeping vistas be understood only from the pictures presented by art teachers as a point of reference for their students? Some scientists are claiming that it is already too late to reverse this terrible decline. Others are more optimistic and believe that if actions are taken now it may be possible to correct much of the damage. There must be an imperative upon every individual to assist in addressing this calamitous situation, and education should certainly be at the forefront of this action. It cannot be claimed that we do not know the causes of the environmental disaster that we are currently witnessing, not only in India and China, but in much of the world. It is unacceptable to expect that those children who are currently attending our schools should shoulder the responsibility for addressing this catastrophe in the future. Is there a place for every child who needs it in this school? At various times during the past ten years I have had an opportunity to work with two of China’s leading university teachers, researchers, and writers on matters concerning inclusive education. Having spent time with Professor Meng Deng at Beijing Normal University, and with Dr Feng Yan from Shaoxing University, I am aware that they have made a significant commitment to assist teachers in their appreciation of the rights of all children to obtain appropriate schooling. They have contributed to the development of courses, the conducting of research, and through their writings, a communication of ideas aimed at promoting a more equitable and inclusive education system. I also know that at various times they have been faced with indifference, dismissed as being focused upon an area of minor concern or even castigated for their audacity in providing a critique of the current education system in China. However, neither of these dedicated colleagues have shirked from their determination to work for a more inclusive educational community that recognises the needs of all children. It was therefore with some interest that I read earlier today an article brought to my attention by a Chinese student, and published at www.womenofchina.cn the website of the All China Women’s Federation. I must admit that I had never previously heard about this organisation or visited its website. The article appears under the headline “China Badly Needs Special Education Teachers, Schools” (I assume there should be an ‘and’ before the word schools). In this article written by someone named Chen Bai, the experiences of parents of children with special educational needs in China are described, with a suggestion that there is a need to move forward to make more appropriate provision for children who have often been denied schooling. The author claims that “The issue of caring for special needs children has been increasingly discussed as China embarks on sweeping educational reforms. By law, all children are entitled to basic education through public and special schools.” She then goes on to present examples of the struggles that parents have had to obtain schooling for their children as a result of the apparent challenges that they present to teachers. This, she postulates, is a reason why the law has been so difficult to implement and progress towards inclusion has been slow. A lack of funding, social stigma attached to having a child with a disability and the small number of teachers trained in special education are reasons that she puts forward, for the lack of momentum towards the provision of better educational opportunities for some children. A national plan issued by the Chinese Government in 2013, aims to ensure at least 90 percent of children described as having special educational needs have access to compulsory education by the end of 2016. The current figure is said to be around 72% which in itself represents a significant improvement over the past ten years. Both Meng Deng and Feng Yan have been working hard to secure this kind of progress in their own regions of the country and it appears that they now have an increasing number of allies. “‘Inclusive education’ that recognizes and meets the learning needs of all students in all schools should be the main theme running through China’s education system in years to come,” Xu Jiacheng, Dean of the School of Special Education at Beijing Union University is reported as saying. During my visits to China over the past few years I have often been disappointed by poor provision made in schools to support children who are experiencing difficulties. I have sometimes been dismayed by the lack of interest that some teachers, and especially those working in universities, have exhibited towards providing training opportunities aimed at increasing the confidence of teachers in addressing issues of diversity. Perhaps now the tide is beginning to turn. Elsewhere in Asia, during visits to Malaysia, Singapore, Hong Kong and India, I have been impressed by the innovation of teaching colleagues and their commitment to address the needs of children who have been previously denied opportunities for learning. Maybe mainland China is now recognising that both economically and morally, a failure to address the educational needs of the most vulnerable in society will have long term consequences for sustainability and resilience within Chinese communities. Let us hope that some of these obstacles are now being removed and that an increasing number of children who have been denied their right to education may at last be welcomed into their local schools. If this is the case, the expertise of Meng Deng and Feng Yan is going to be in great demand as more teachers seek the professional development that will increase their confidence and competence in this area. Without the assistance of Tao Yuhong (Dolores), my learning difficulties are exposed in China! Inevitably when working in Asia I have language difficulties. Typical of most British people, my knowledge of European languages is limited, but when it comes to the languages of Asia I am completely at a loss. In India, Singapore, Hong Kong and Malaysia I have usually found a number of people around me who speak a good level of English. In China, and particularly on this visit to Xinjiang Province this is most definitely not the case. In such situations I am obviously dependent upon an interpreter or two to get me through meetings, my teaching or conference presentations and to assist me in social situations where I am otherwise like the proverbial fish out of water. Fortunately on this visit I have been assigned an interpreter with superb English and the kind of understanding of local custom and etiquette that keeps me out of trouble. Tao Yuhong (Dolores) has not only assisted me in teaching, but has been a constant presence at meals and in other social situations where I would otherwise falter. (Did you know that if you sit at the head of a fish at the dining table you must propose a toast to whoever sits at the tail? – no neither did I!). The professionalism of good interpreters always amazes me, not only do they need to know the language well enough to speak with authority, but they are also required to navigate the technical nuances of the subject of the person for whom they translate. Sitting with Tao Yuhong prior to sessions and going through presentation materials ensures that terms such as inclusion, assessment for learning and differentiation are understood. This enables an audience to be reassured and assists them to find the meanings and concepts through the translation. It also inspires confidence in the presenter. I think it is quite good to place oneself in a relative position of helplessness such as is occurring with me at present. Finding myself in a situation where I cannot manage the spoken language and have no hope of reading the Chinese or Uighur script that surrounds me I have some idea of how many children who have learning difficulties must feel. As a normally (reasonably) self-sufficient and competent adult I have reverted to being as dependent as a child and look to others to support me in the most basic of situations. Of course, a significant difference between myself and most children with learning difficulties is that I am in a very different cultural context and as a rare visitor to this part of the world nobody is suggesting that I be taught the language and gain a degree of personal autonomy. Also unlike children who have learning difficulties, in a few days time I will be back in familiar surroundings and will almost miraculously have recovered my learning competence. Perhaps it would be good for all teachers to experience this situation from time to time if it made them think of the challenges faced by their pupils. Such an experience makes us re-evaluate terms such as independence and competence as well as encouraging us to think about how we go about understanding the world we find ourselves in. 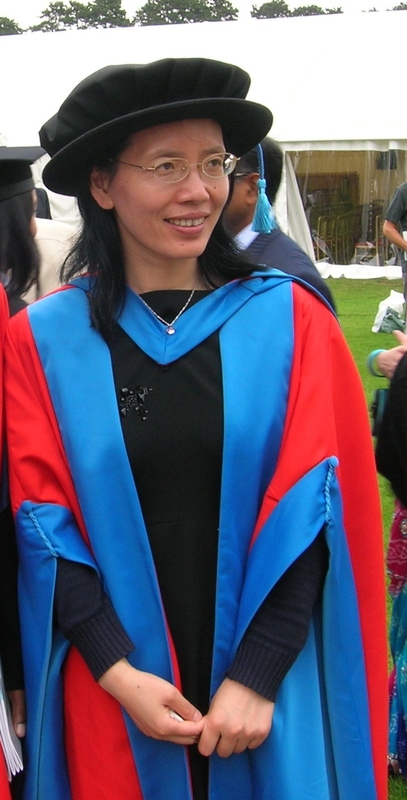 For now I would just like to say thank you to Tao Yuhong (Dolores) for being my teacher and carer for a few days here in Urumqi. Your skills as an educator were greatly appreciated. I hope that I have not been too troublesome a child! Far more important than the words that I have been posting on this blog are the responses that have been made by others. Whilst I have endeavoured to raise issues and promote debate around the definition of inclusion, the nature of learning and what we value in education, it has been the replies from a broad range of individuals that have encouraged the further development of ideas. “The Parents went to a school in their locality and were turned away. The principal said that they stopped taking children with special needs because they stopped getting admissions from typically developing children”. “What I seem to be hearing time and again is that children even with mild difficulties or who learn differently should not be a part of the mainstream setup”. Let’s be clear here, though both of these examples come from Karnataka State in India I could just as easily have provided similar quotations from colleagues in other countries, including my own. Why is it that when some teachers and schools have embraced the idea of creating schools that are welcoming and more inclusive in their teaching approaches, others remain so resistant? Is this simply an entrenched negativity towards children who are in some way “different” from what we have come to see as the norm, or are there other underlying factors? There is one thing of which I am sure and that is, if those of us who advocate change in our education systems simply keep pointing a finger of blame, we are not going to make progress and are far more likely to alienate those who are resistant. We need to be motivators rather than critics if we are to make progress in this difficult task. We need to begin by accepting that ignorance and fear are common factors that have always been to the forefront of discriminatory practices against minorities or marginalised groups and that our role as educators is to challenge these two characteristics rather than attacking those who are ignorant or fearful. Furthermore, we need to examine some of the cultural issues that may need to be addressed if we are to support teachers in making progress. Feng Yan illustrates here an important issue that we must not avoid. Chinese society, in common with other Asian countries including India is developing fast as an economic super power ready to compete on an international market led stage. Because of this educational priorities have been focused upon the development of a more literate, technologically able workforce equipped to meet the needs of a western style competitive market. The impact upon schooling has been to concentrate upon the professional development of teachers to ensure that they can prepare a generation of high flyers ready to adapt to an increasingly competitive working environment. This has created a teaching profession that is highly skilled in addressing the needs of the most able students and those seen as likely to make a contribution to the economic advancement of the state. This is, of course a major obstacle to the development of inclusive schooling within China and elsewhere in Asian countries. Convincing policy makers of the valuable contribution that individuals with disabilities or special educational needs can make remains a challenge. Those of us from wealthy western countries need to be aware that changing the opportunities for marginalised learners will not be achieved by bludgeoning teachers into accepting change. Within her book Feng Yan provides a direct quotation from an interview with a teacher in a mainstream school. This teacher sums up the major challenges faced in promoting inclusive practice in many countries. Large classes, poor resources, teachers who feel that they lack the confidence or competence to move forward. Pointing a finger of blame will not help, but neither will inactivity or resignation. 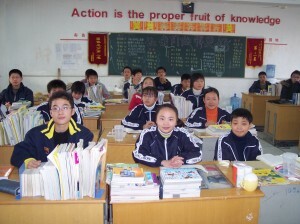 Feng Yan is continuing to work for the promotion of inclusive education in China. She is battling against considerable odds, but has recognised that she needs to understand the perspectives of teachers under pressure and offer support rather than criticism. If we are to change attitudes we must do so by enabling teachers to feel valued and to recognise that even small changes in their teaching approach may make a significant difference.